Russia and India need to develop a joint defence cooperation framework for joint research, design and development and marketing of defence items. Prime Minister Narendra Modi’s emphasis on self-reliance in defence while dedicating the INS Vikramditya to the nation has made considerable stir for good. He stated, “Why should we import defence equipment? We must be self sufficient. Why can’t we send our defence equipment to other nations?” Emphasis of India’s policy makers on self-reliance in defence, or in other sectors, is not new. The issue is whether self-reliance is realizable at the present state and speed of India’s defence preparedness. It is also interesting to explore how far India’s traditional allies like Russia can contribute to such a quest. Self-reliance has been a mantra for India’s policy makers since India’s independence. The first Prime Minister, Jawaharlal Nehru was known for his emphasis on scientific temper and enquiry, necessary for self-reliance. India adopted planning system from the Soviet Union, and pursed a policy of growth suitable to its requirement and status. In defence it depended on Soviet Union. The trend continued even after the Soviet collapse. Despite dependence on this ally, self-reliance in defence has been emphasized throughout. The self-reliance mantra was vigorously pursued by the predecessor government of Modi. 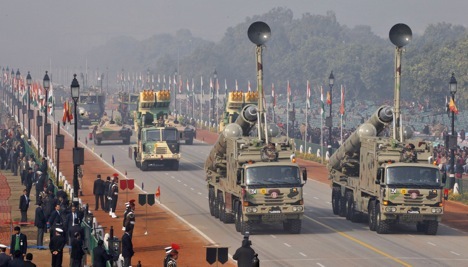 The flagship body of India’s defence planning and development, Defence Research and Development Organization (DRDO) prepares a plan according to which between 2020 and 2025 India will be 75 percent self-reliant in defence. As Modi pointed out on board the Vikramaditya, India aspires not only to be self-reliant in defence items but also to market them particularly among small countries. Avinash Chander, Director General of DRDO, and also Scientific Advisor to Defence Minister pointed out that the missiles like Akash, Prahaar and BrahMos are in high demand from other countries, and the defence ministry is developing a framework to capture this export potential. Despite the confidence expressed by the director general, the fact remains that India is dependent on others for critical technology in defence. Lack of creativity and innovation and shabby work culture within the defence establishment are sure roadblocks against high aspirations. There is high corruption in defence deals and procurement. Whatever innovation the defence industry boasts of is mostly confined to reverse engineering, implying the unveiling of technology behind an imported item and using it. Having high aspiration to be a world leader in defence production is nothing unusual, and for a country of India’s size and security dilemma, and troubles at the borders and in the neighbourhood, it is a genuine aspiration, but the current state of technology and preparedness does not substantiate this aspiration. One may not be surprised if the goals set by the DRDO for 2025 falls short, unless the shortcomings are addressed. How far can India’s traditional allies help fulfil its aspirations? Russia has been a strategic ally of India since a half century and it has supplied India weapons, their spare parts, and has gone a step ahead to have joint research and development of weapons. Almost half of India’s weapon system is of Soviet/Russian origin. The supersonic cruise missile BrahMos is one of the shining examples of joint research and development. It is only such of kind of bilateral engagement any two allies enjoy. The aircraft carrier on which Modi chose to declare India’s ambition was supplied by Russia last year. Though Indian leaders were peeved at the delay and later additions of cost to the carrier, it is needless to mention that the aircraft carrier significantly boosted India’s military capability. Russia can meet India’s aspirations. But before that India has to tidy up its defence system by introducing reforms. The current 26 percent cap on foreign direct investment can be made flexible particularly in non-sensitive areas. There should be effective coordination between the ministry and army to weed out corruption and to devise strategies. Modi’s initial policy manoeuvres have shown promise in this regard. Besides, given its close relations with India and its understanding of India defence requirements, Russia can play a proactive role. Russia and India need to develop a joint defence cooperation framework for joint research, design and development of defence items and their marketing abroad. BrahMos has already proved a success in this direction, and this example needs to be followed. India-Russia defence cooperation is in a good shape. Russia has also taken into account India’s apprehension in its defence deals with India’s neighbours, particularly Pakistan. Hence, it will be for mutual interest to develop joint defence productions. There are enough avenues to discuss bilateral defence cooperation. Russia can contribute to India’s quest for self-reliance in a steady pace. But, for that to happen, India must clean its house and incentivize innovation and creativity and promote accountability and transparency.